Pilafs are a lovely, easy way to make a quick meal — a wide range of ingredients meld together into a coherent whole. So I’ve been making a lot of them lately. The base here is black rice — not wild rice, which can cost as much as 60 shekels a kilo, but black rice, a shorter grain cousin that costs significantly less. It’s dense and chewy, high in fiber, and it’s considered an heirloom variety. I purchased it at Nitzat Haduvdevan. 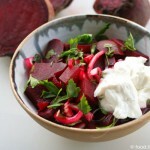 It also happens to turn a deep purple once cooked, making it a lovely visual match for roasted beet. 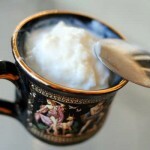 The flavor combination is mild and subtle, accented with rich, salty goat feta and the zing of spring onion. And there you have it — a wholesome, simple meal. I like to roast all sorts of vegetables at the same time in order to maximize use of my oven (and have food on hand for the next several days) — including squash, cabbage for this salad, peppers — but if you don’t feel like using your oven for just one beet, you could steam the beet in the microwave instead. Prep time: 10 minutes. Cook time: 30 minutes. To prepare the rice: Simmer rice with 1.5 cups of water on a low flame for about 30 minutes, until the water has cooked away and the rice is al dente. 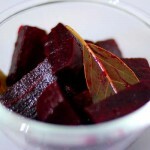 To prepare the beet: Wrap in tinfoil and bake in the oven on maximum heat until soft. (In my oven, this means 240 Celsius for about 30 minutes. I usually bake other vegetables at the same time.) Alternately, if you don’t want to use the oven, chop the beet into quarters, put into a microwave-safe bowl with a cover and nuke for 10 minutes until soft. Once the beet is cool, grate it into thick shreds. Once the prep is done: Mix all ingredients together and serve. 2 Responses to "Black rice pilaf with beet and goat feta"
This looks fabulous! 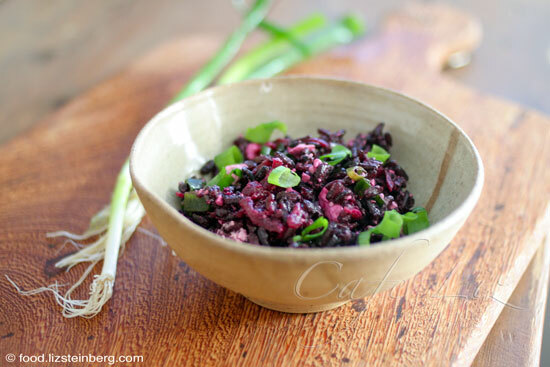 I love black rice and mixing it with beets makes a gorgeous dish. Can’t wait to try.